The PAX-682-960-US from Paxton is a one door system starter kit. It comes with a Net2 Plus access control unit which has onboard TCP/IP to allow for direct connection to a computer network. It can also be connected using a dedicated RS485 network to reduce the number of TCP/IP network points in a larger system. In the event of a communications failure, it’ll continue to permit or deny access to users until a connection is reestablished at which time, reporting back to the PC will resume. The Net2 Plus comes with a metal cabinet with a 24VAC power supply. 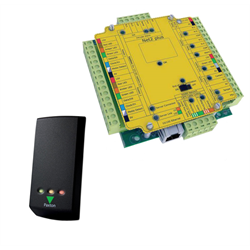 The kit also comes with a proximity mullion reader which is an RFID device that allows for contactless authentication. When connected, all three LEDs (red, green and amber) are lit. If access is granted, the green LED flashes and if access is denied then the red will flash. The Amber light will remain on to show a state of waiting and may flash during an anti-passback check. All light state changes are accompanied by an audible tone.